If you live in Keokuk, there are two simple ways to get items from us: Order them from our online store with just a few clicks, or stop in our location at 710 Main St. Keokuk, IA 52632. We do a lot of business online, but we also love seeing customers face to face. If you like the efficiency of shopping online, you can order from our website 24/7. If you prefer the experience of in-store service, stop by our store during normal business hours: Monday – Friday, 9am – 4pm. We’d love to see you, and provide customer service the traditional way! Whichever option suits you, we’ll make sure you get the products you need, when you need them. Customization is one of the main reasons recipients of our awards love them. Customization is optional, but it’s a cost-free option that adds a personal dimension to the items you give. Instead of a generic item that offers a vague form of recognition, customized products call out individual teams or recipients for their participation or great performance. So, we encourage you to get creative and customize your awards to make them more memorable! 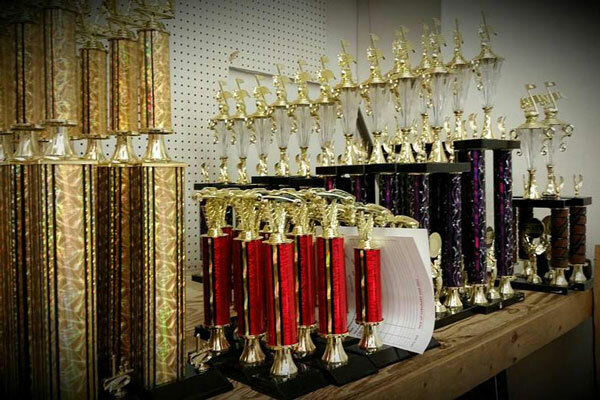 For questions about our award trophies, award plaques, award medals, gift and accessories, promotional items, or something else, please call us today at 866-282-0847, or use our contact form. We look forward to serving you!